The Goa'uld System Lords is a loose, fuedal hirearchy which governs the Goa'uld race in both the Milky Way Galaxy and the SW-1138 Galaxy. The System Lords believe themselves to be gods and are dedicated to the subjegation of all other sentient races. The Goa'uld System Lords came to power shortly after the Goa'uld began traveling to other worlds and conquering races with the help of reverse-engineered or stolen Ancient technology. By and large taking on the appearance of, or possibly inspiring, several mythologies and godlike legends throughout the galaxy, the Goa'uld delighted in subjegating and enslaving primitive races. Originally taking their hosts as the Unas, the Goa'uld discovered humanity around 8 or 9000 BC. The Goa'uld Supreme System Lord, Ra, saw these humans as perfect hosts, and began to cultivate them around the galaxy. It is unknown when the Goa'uld discovered in the SW-1138 Galaxy came to be, but due to their close ties technologically with the rest of the System Lords, and in general, their close political ties to the House of Ra, it is suspected that they were a sub-domain of Ra who may have discovered the Route of Ages in one of it's brief-but-known opening spurts. It is unknown whether or not the Goa'uld hail from the same Milky Way Galaxy as the United Federation of Planets, though the discovery of StarGates makes this likely—however, outside of through StarGate travel, no Goa'uld settlement has ever been discovered by the Federation. Following a rebellion on Earth in roughtly the third millenium, the Goa'uld forgot about Earth, having settled humans or other human-like races on enough planets throughout the Galaxy to ensure a capable and self-sustaining supply of slaves and soldiers. The Goa'uld also began to genetically alter the strongest and most capable of their slave-army to create a race known as the Jaffa, which also serve as living incubators for Goa'uld Larva. The Goa'uld largely went about their business in the Milky Way, fighting and fueding among themselves for power and prestige, until late 2381 when Ra recieved word that the humans, or taur'ri, had advanced enough to be a threat to them. Ironically, this came following the disasterous first contact mission between the U.S.S. Explorer and a Goa'uld System Lord based not out of Federation (and Ra)'s home galaxy, but in the Outer Rim of the SW-1138 Galaxy: the feircesome and brutal System Lord known as Anuke. This first contact occured on the eve of the historic Treaty of Naboo which aligned the Federation and the New Republic, and the Goa'uld turned their attention towards this powerful alliance between two potential enemies. Largely ignoring the Federation, the Goa'uld began moving more and more throughout the SW-1138 Galaxy, conquering primitive or unguarded planets, going so far as to attack the New Republic capital on Coruscant, as well as making multiple excursion into the Federation Expansion. The Goa'uld sent many of their Ha'tak motherships to anihilate local cultures, occassionally attacking the spaceport desert planet Tatooine in order to disrupt ships coming through the Route. The Federation suffered a major loss when Anuke destroyed the Hyperspace research station in the Rennack System, massacring the colonists, and the Republic's Star Destroyers found themselves matched in strength and power by the Ha'Tak vessels. However, after Zon Huntreas killed Anuke, the Goa'uld rampage through the galaxy seemed to fade. Other System Lords, such as Thel and his father Lord Kyet began to rise to power, perferring surgical attacks of terror and intimidation through the Stargate network over long-range and costly ship to ship engagements. However, this was because the majority of the House of Kyet was already engaged in a costly and disruptive war against the Peacekeepers, as Haweke Karbn and Buzz Argonon discovered while exploring the Stargate on the behalf of GWAM!. Later, Haweke and the crew of the Palindrome/ would go onboard a dangerous adventure to steal and salvage a Goa'uld Mothership that had crashed into the sands of Tatooine, on the behalf of Serenity, Inc. This successful salvage was then later sold to the New Republic for study for an astounding amount of Two Billion Credits. Later still, Thel captured Karbn in order to take advantage of the man's reputation as a hok'taur, or advanced human, and download the Ancient Repository into his mind. In doing so, the System Lord twinned the man, before both newly created 'Haweke's' were rescued by his friends and allies admist a Peacekeeper attack squadron who were after the same database of Ancient knowledge. With all sides unsure which of the two newtypes had the information downloaded into his brain, the Peacekeepers and the Goa'uld met in the skys above Tatooine's major spaceport, causing the First Battle of Mos Eisley. This signified the opening battle in the Goa'uld-Peacekeeper War. The Goa'uld-Peacekeeper War was a long and brutal battle, which each side attempt to overwhelm one another with advanced technology and overwhelming force. The Peacekeeper forces were largely orchestrated by Commendant Atrenzu Vezenak, with Lord Kyet taking over after Thel was crushed by an avalaunche during the Battle of Mos Eisley. Kyet was able to rile a number of System Lords to his cause, many of them sent by Ra to anihilate the Peacekeepers. While the Goa'uld had the edge on territory, the Peacekeeper's superior tactics and cohesive force won over the Goa'uld's deceptive and backstabbing, egotistical fleet planning. During the Colodial Belt Engagement, Captain Yeelan Merkyed and the Command Carrier Cervantes anihilated the superior Goa'uld fleet, forcing Lord Kyet to resign in shame. Many lesser System Lords had fallen during the war, and by the end most of the Goa'uld's Outer Rim territory had been ceded to the Peacekeepers. Lord Kyet was confined to a few worlds, and Ra had decided wisely not to persue such an aggressive position at the moment. The Goa'uld have a fuedal system, broken up into houses roughly along the lines of succession. Though they take on a kind of familiar structure to their Houses, they lack any real sense of loyalty, focused only on gaining personal power in any way possible, with a maniacal, egotistical sense of ruthlessness that can sometimes boarder of self-parody. A Goa'uld is called a System Lord when they accumulate enough power to rule a solar system, and while the vast majority of System Lords have only a planet or two, the phrase 'System Lords' often refers to the strongest and most powerful of the Goa'uld, which regularly meet in council. Despite this vestige of democracy, the councilmembers consistantly plan and plot against one another, and in general, two System Lords will only work together until one senses a weakness in the other. It is quite common for ships, armies, and whole worlds to change affiliation from one System Lord to another following the rise of a newer Lord and defeat of an older one. The Goa'uld control a vast majority of systems, though the number of their worlds are hidden from general consumption. It is known that their forces in the SW-1138 Galaxy were not too far from the Arkanis Sector, and that what is known as Peacekeeper space now occupies much of Lord Kyet's previous holdings. The Goa'uld run a brutal dictatorial regime which steamrolls over countless slaves. Their Jaffa warriors keep the slaves in line, as well as serve as front-line troops, and on occasion, advisors. Any System Lord will keep legions of Jaffa at any given time. The Jaffa serve as front-line soldiers, trained in both hand to hand and long range tactics and combat. Most Jaffa are faster and stronger than a normal human, with the best of the Jaffa boasting almost superhuman combat abilities. The Jaffa's armor protects them against minor energy weapons and most projectile weaponry and melee weaponry, though vibroblades, armor piercing rounds, and high energy weapons easily pierce their hide. Jaffa also wear a mostly ceremonial headdress, which can fold out into a full helmet with advanced HUD capabilities. However, this makes the warrior off balance and a larger target, so it is rarely used. Likewise, most Jaffa carry a Goa'uld Staff Weapon, which uses naquidah as a fuel source and is capable of incredible high-energy plasma attacks, as well as a deadly melee weapon. The Goa'uld utilize a particular high energy and high velocity interceptor known as a Death Glider. The Death Glider has no dedicated FTL travel system, but is capable of flying across a solar system unaided, and is equipped with two heavy Staff Cannons and a complete inertial dampner system to enhanced manouverability. The Goa'uld have no need for boats! When the Goa'uld fish, they do so with Staff Weapons! JAFFA KREE! The bulk of the Goa'uld forces are stationed on starships, and while most of the Goa'uld space fleet are highly customizable and are designed to be operated cheaply and efficiently (as the Jaffa are not trained to understand 'the magic of the gods'), the most common vessel is the Ha'tak mothership, which houses thousands of troops and hundreds of Death Gliders. Other vessels includes specialized troop transports, Al'kesh bombers, and midrange Tel'tak cargo vessels. Goa'uld economy is rather simple- -the population of the planet will live, work, and die for their Gods. All minerals and material goods go to the System Lord as to further their own excesses or their military workhorse. All of the 'citizens' under Goa'uld rule are either Jaffa, or slaves. While higher ranking Jaffa often enjoy the pleasures that come with power, most are simple warriors, and slaves are generally given the lowest standard to live upon. Seeing themselves as Gods, the Goa'uld generally overtake primitive planets and utilize their advanced technology to force a less advanced civilization into slavery and worship. Aesthetically they differ as per the taste of each individual Goa'uld, though the majority of their culture perfers an ancient Egyptian style, which has put them at odds with the Children of the Nile more than once. While the Jaffa are raised well and often have their intelligence groomed for combat, technical measures are generally carried out by slaves directed by trusted aides, many of which are killed after the Goa'uld has finished building the newest starship. The average citizen under Goa'uld rule does not know how to read or write- -in fact, under the slave caste, writing or any type of symbol-making is forbidden. This, like many crimes, is punishable by death under Goa'uld rule. The Goa'uld symbiotes give their hosts long life as well as superhuman strength and senses, which allows them long-life, which is further increased through the use of their sarcophagus devices, which can rebuild tissue and reimbue life in the recently dead. The majority of their technology, including their handheld ribbon devices and personal shields, are all designed to convince others that they possess omnipotent, godlike powers, including telekinesis, astral projection, and intimidation. Likewise, the Goa'uld have a distinctive eye-flash which can occur when the symbiote is angered, and they often speak in an especially intimidating flanged bass enhanced voice, though they can also choose not to. 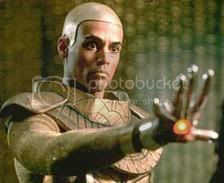 Thel was a dangerous System Lord who attempted to meld his knowledge of Goa'uld Technology with arcane magic. He was also capable of using the Force, due to his host having been a Jedi. In mental combat with the Jedi for thousands of years, when Thel twinned Haweke Karbn the resulting battle dropped a mountain on him. Near death, Thel recovered and was able to assume full control of his host's faculties for the first time. Thel then attempted to build a Droid Army of Death, but the robots proved to be poorly equipped and poorly programed. Still, with superior numbers, he instituted a galaxy-wide war against the United Federation of Planets and the New Republic. He was killed by Jathix Eressa when he attempted to conquer the Sith planet Korriban. His forces were later defeated at The Second Battle of New Archer, and were later subsumed by S'Tan and Thel's Father, Lord Kyet. Little is known of Lord Kyet, save for that he controls a large empire in the Unknown Regions. He put Thel in charge of many useless projects due to his confidant knowledge that Thel's Jedi host was fighting against him. When Thel won control over the host body, Kyet was deposed and sent into hiding. He is currently at large. S'tan, or "Stan," is a rival of Thel and Kyet. He is the first known Goa'uld to take a Vulcan (Captain T'mlik, formally of the Explorer and friend of Zon Huntreas) as a host. S'Tan initially attempted to impersonate the mythological figure of Satan, but quickly realized the forces of the Kukai Foundation were not impressed. He is currently in possession of a large fraction of Thel's droid army and is attempting to outfit it with Starfleet technology, with little success.